At midnight, I came home to find a bird hanging from the inside curtain of my front door. Since it’s so close to Halloween, I was afraid to open it. Did someone kill a bird to get to me? My mind was racing. After someone had put sugar in my gas tank recently (which nearly killed my car’s engine) I’ve been on edge. Was this the next step in my own psycho-nightmare? I didn’t want to see a dead bird. I absolutely love all kinds of birds! Every day, I work hard to keep them hanging around my Idyllwild home. I regularly change the sugar water in my hummingbird feeder. I put out pellets and bread crusts out for the birds, but it’s the bluejays who get most of them. Three years ago, I planted a Fuji apple tree, which finally bore seven apples this year, and didn’t say a word when the bluejays poked holes in all of them. But with four cats, there’s no way I could have a domestic bird. Remarkably, my cats are also tender-hearted because the birds, mice and lizards they bring to me as “gifts” are still very much alive. They are scared, ruffled and shaken, but still alive. Then it’s up to me to capture them and put them back outside where they belong. I turned the key, opened the door slowly, and quickly flipped on the light. The junior woodpecker, as it turns out, was still alive! 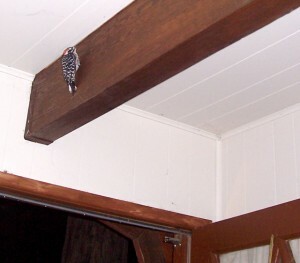 He flew from the curtain to the ceiling beam (where I couldn’t resist taking his picture). 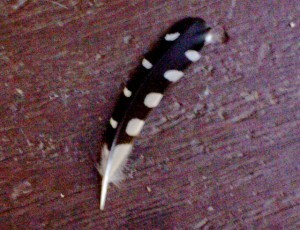 He was beautiful, with a bright red crown, and white and black markings on his feathers. Now, how do you get a scared bird out of your house at midnight? After putting the four cats in the bedroom, I opened up all of the windows and doors. But the little guy didn’t budge. So I started toward the kitchen to unpack my groceries, absent-mindedly turning on more lights. That’s when Woody Jr. took flight. But it was painful to watch. He flew towards the back door, bumping his head on the ceiling four or five times. He ended up behind my refrigerator, scared to death. So I unplugged it, and risked ruining a few things. But the refrigerator buzzing annoys even me, so I can’t imagine how a young woodpecker could stand it all night. So I shut the windows and doors, and went to bed. I shook off the death notion. It was a woodpecker, after all. And it was likely dragged in through the window by one of my cats. The next morning, while I was making toast, I saw him again–clinging to a wine bottle that had colored wax dripped all over it. “Does the wax resemble tree bark to him?” I wondered. He kept nervously darting his head back and forth from behind the bottle. So I opened up all of the windows and doors again, warning him to watch the ceiling this time. So I got out my camera to take another picture, and he flew towards the ceiling. He landed on a picnic basket on the top shelf. So that’s where I left him to go run errands. I figured my presence was making him nervous, but I was also taking a risk leaving my house open during a recession. When I returned, Woody Jr. was gone. I missed his farewell flight, but was glad that he was back to his normal life in Idyllwild. He left me a memento, though. 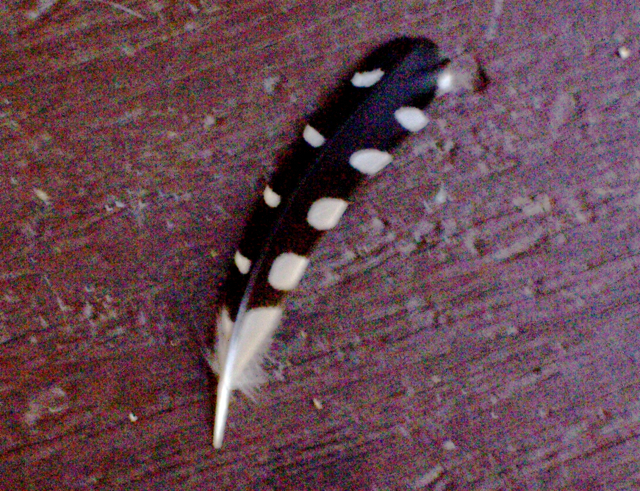 A small feather that dislodged during his overnight stay.